HomeIncident Response Plan FISMA / NIST What Does NIST Say About Incident Response? What Does NIST Say About Incident Response? The National Institute of Standards and Technology (NIST) produced a list of Security Controls for Federal Information Systems. Incident Response is one of the controls. In Special Publication 800-53, revision 3 NIST included Incident Response as 1 of 18 families of security controls. For the complete list see the end of this item. Much of the material is useful beyond the Federal government. 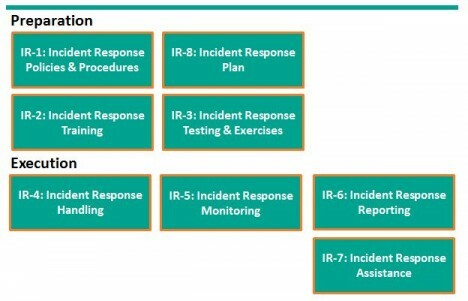 First, NIST provides a useful framework for considering Incident Response (IR). Please don’t let the control numbers confuse things. I started with preparation, but NIST considers IR Planning as IR-8. Incident Response preparation starts with Policies and Procedures and the preparation of an incident response plan. With the plan in hand, train users how to recognize and report incidents, train the response team how to organize and react. For some incidents, actually testing the plan with field exercises may be needed. Incident response execution includes handling, monitoring, reporting, and possibly additional assistance from specialists. 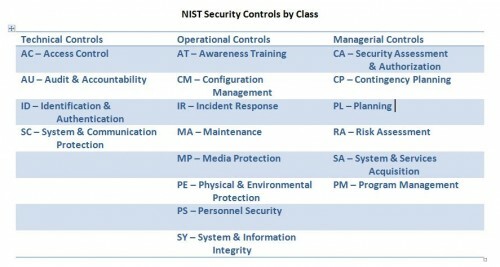 NIST suggests each organization consider these controls and determine when or whether they apply. In SP800-53, Revision 4 Draft, two additional controls were identified: IR-9 Information Spoilage Response and IR-10 Integrated Information Security Cell. The first addresses the additional needs for damaged or leaked information. The latter describes the organization of a specialized element of the Incident Response Team. Provides road map for implementing incident response capability. Describes the structure and organization of the incident response capability. Provides a high-level approach for how the incident response capability that fits into the overall organization. Meets the unique requirements of the organization, which relate to mission, size, structure, and functions. Provides metrics for measuring the incident response capability within the organization. Defines the resources and management support needed to effectively maintain and mature an incident response capability. Is reviewed and approved at an appropriate level. I heartily agree with NIST’s declaration. Here is the complete list of security control families identified in SP 800-53 and organized by the three control classes: Technical, Operational, and Managerial.